Right now we are in the season of Imbolc, which is a sabbat usually celebrated in the first few days of February, along with my birthday. This is my season. I don’t think it’s a coincidence that I have begun studying the Old Religion in the season of my birth. I also find that I identify with the goddess in which this season honors. Her name is Brigid (with varying spellings over the years in different cultures). When I was studying the different sabbats and the Wiccan calendar in this blog, I briefly touched on Brigid’s role in Imbolc and I immediately felt the pull to study her further. I think Brigid is very revered and honored today because she has several faces (quite literally) and manages carrying herself in a masculine world, much like women in this modern age. She is so revered that she was a pagan goddess that became a Catholic saint. St. Brigid’s Day is February 1, which was typically the festival of Imbolc. Brigid originates in Irish mythology. Her name means “the exalted one” and she was the daughter of the Dagda, who was a very important god of Irish mythology as well, being known as “all-father” and the protector of the tribe. She had two sisters, also named Brigid, and therefore, this makes her known as the triple goddess, often depicted with three faces. She has two oxen, Fe and Men, a boar known as the king of boars present in Arthurian legend, and the king of sheep too. 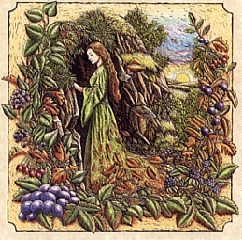 For this reason, she is associated with sheep and other animals that begin the rebirth season during Imbolc. The word Imbolc comes from the lactation of the ewes, the flow of milk that heralds the return of the life-giving forces of spring. Later, the Catholic Church replaced this festival with Candlemas Day on February 2, which is dedicated to the Virgin Mary and features candlelight processions. The powerful figure of Brigid the Light-Bringer overlights both pagan and Christian celebrations. Brigid’s divine responsibilities are many and varied. She is considered a mother goddess and goes back as far as the word brihati in Vedic Sanskrit, which is an epithet of the divine. Her wisdom is vast, being the one to inspire and protect poets. 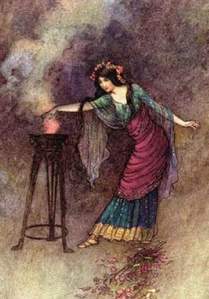 In her time, poetry was associated with seers and that made her seen as the great inspiration behind divination and prophecy, the source of oracles. Given my profession, I found that rather interesting. 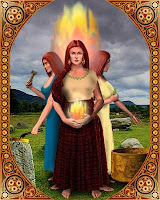 Her two sisters are Brigid the Physician and Brigid the Smith but it seems to me that the three sisters are basically just three facets to the same triple goddess. She is a healer and a master of the flame in these other two faces of her existence. When Christianity came to Ireland, this goddess was transformed into a saint who was able to miraculously increase the milk and butter production from cattle in Kildare. Interestingly enough, my ancient Irish ancestry came from Kildare! Brigid is my lady! 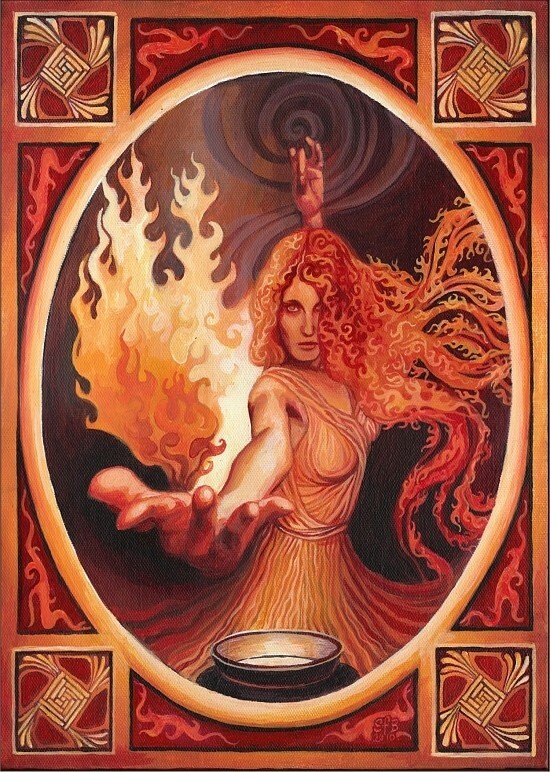 There are lengthy legends and tales about Brigid being the keeper of the flame and it extended fully into her incarnation of Saint Brigid as well. The fire, the light in association with the festival of Imbolc involves giving hope that the death of winter will soon be over and the rebirth of spring will soon come. Candlemas was celebrated in Christianity all the way up until the Reformation. Again we see symbols of light chasing away the darkness for humanity. The third side to Brigid is her ability to heal and many healing wells and springs are named after her in Ireland. In the celebration of Imbolc, it’s time to clean your home and remove everything associated with Yule, the season prior to Imbolc. 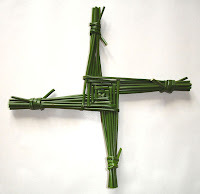 Beginning on February 1, it is appropriate to make Brigid’s crosses out of rushes or straw and hang them mainly in the kitchen where your food will be blessed. The crosses can also protect your home from fire and evil, should Brigid choose to bless you. Also on February 1, it is appropriate to put offerings of milk, bread, butter and cake outside of your door for Brigid and her cow as they walk through your neighborhood that night. Also leave a silk ribbon on your doorstep for Brigid to bless that night and you will be able to use it later for healing purposes. Meditation upon the issues of growth in health and strength in the coming year for yourself, your family, your community, the planet, the universe, etc., and asking Brigid for her blessing in those endeavors is also necessary during the Imbolc season. Put candles in your windows as symbols of the rebirth of the sun. Honor the Maiden as she prepares to be a bride by decorating your home with white flowers and offering them to her. As I announced before, I have made the decision to devote myself to the study of the Old Religion because it feels more natural with my existing convictions. For right now, I’m studying as a solitary practitioner. I’m sure I will join a coven at some point; most likely the House of RavenStone here in Atlanta. I find I learn better if I rewrite things in my own words, so I will occasionally write about things I’m learning here in my blog. Today I have been learning the Wheel of the Year, which is basically the Wiccan calendar. 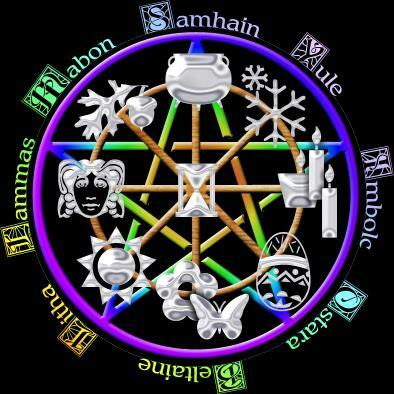 It is divided into eight sabbats that honor and celebrate the earth’s natural cycle of seasons. Within the year, there are thirteen full moon celebrations as well, which are called esabats. Once you learn the pattern of the calendar and recognize the natural flow of it (as well as the obvious holiday thievery by early Christians), you see that it makes more sense than any calendar of holidays today. This is based on celebration of the seasons, equinoxes and solstices. 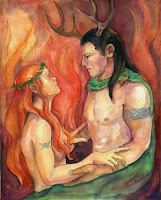 Eostra (also called Ostara) and Mabon are the spring and fall equinoxes. This is when day and night are equal in length. Yule and Midsummer are the winter and summer solstices. This is when day and night are at their longest and shortest in the year. Between the solstices and equinoxes are sabbats called Imbolc, Beltane, Lammas, and Samhain, which are to mark the seasonal changes through ritual and recognizing the presence of the gods and goddesses in all things. Then you have the thirteen full moons to celebrate rebirth and new beginnings, while the dark moon celebrations are to celebrate banishment of negative influences. This is considered the most important sabbat because it is a time to honor and respect those who have passed on, from ancestors to friends to pets and beyond. Sometimes the spirits of the departed are invited to join in the ritual. 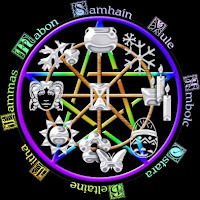 It is also the festival of darkness to be the balance of the opposite point in the wheel, Beltane, which is the festival of light and fertility. 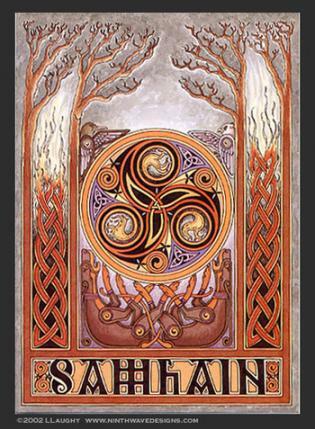 Samhain typically begins at sundown on October 31. This is the point at which the veil between the earthly life and the afterlife is the thinnest. Most people celebrate Samhain without even realizing it in the form of Halloween. This sabbat eventually became Christmas to the secular world. Yule is the point of the winter solstice and celebrates the hope for a fertile and peaceful season. 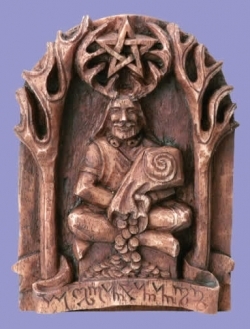 It also celebrates the rebirth of the great horned hunter god, who is the newborn solstice sun. He is the male to the female, the balance again, just as the winter solstice is the balance to the spring solstice. It is a celebration of the ending of the dark half of the year and the return of the light half of the year. Most Yule traditions have been adapted into Christmas traditions since the rise of Christianity. This is the time for dedication once again and pledges for the coming year. It is the rebirth, the new spark of life, the ending of the darkness and the beginning of light – the beginning of spring. Brigid is honored at this time as the triple goddess. She comes from Celtic tradition but the Catholics created St. Brigid’s Day to coincide with Imbolc. This is a traditional time for initiations and it is generally seen as a womens festival. Lambs are also symbolic during this season. 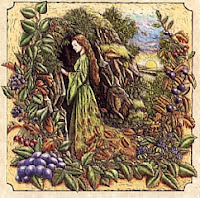 Brigid is a goddess often celebrated by poets and those with creative energies. She strikes me as a jack of all trades, a goddess who can do anything, etc. I like her. Otherwise known as Ostara, it is the spring equinox. Traditionally, it is the celebration of the Mother Goddess being reunited with her son, who spent the winter season in death. Other variations of this sabbat include the young God regaining strength in his youth after being born at Yule, and the Goddess returning to her Maiden aspect. The Goddess has three forms – the maiden, the mother, and the crone – all celebrated symbolically with the passage of the seasons. 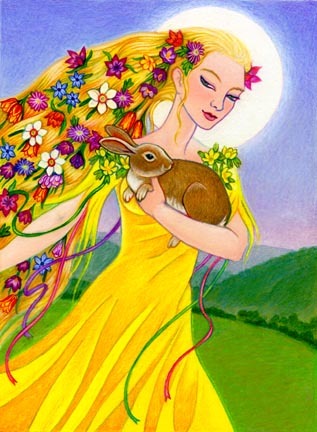 Eostre is the goddess associated with this sabbat and she is the reason why Christianity has Easter. 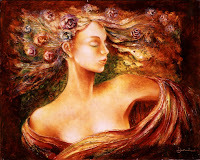 She is connected to fertility and renewal. Eggs and rabbits are sacred to her. Sound familiar? Again, this sabbat focuses on fertility like Eostra and it also employs the use of a bonfire. Sometimes there is a ritual of maypole dancing. There may also be an enacting of the union of the May Lord and the May Lady. It is a celebration of love, sexuality (although no sexual rituals are observed! ), fire, fertility, male, female, union, and so forth. May morning is a magickal time for wild water (dew, flowing streams, and springs) which is collected and used to bathe in for beauty, or to drink for health. Beltane marks the return of vitality, of passion. Ancient Pagan traditions say that Beltane marks the emergence of the young God into manhood. Stirred by the energies at work in nature, he desires the Goddess. They fall in love, lie among the grasses and blossoms, and unite. The Goddess becomes pregnant of the God. To celebrate, a wedding feast, for the God and Goddess must be prepared. This is the height of summer and the days are at their longest. It is the summer solstice, balancing the shortest days of the year at the winter solstice, or Yule. It can also be called Litha. Midsummer became the nativity of John the Baptist in Christian tradition. Midsummer Eve is the evening of herbs. The herbs and flowers gathered this night are considered exceptionally potent. It is at Midsummer that the Holly King, God of the Waning Year, has encountered the Oak King and succeeded in usurping the reign of the year. In Celtic Mythology the Young God withdraws into the Wheel of the Stars and it is here he waits and learn before his rebirth at Winter Solstice. It is the time when Belenus, Belenos – the Sun god, begins to die, fir-branches; Balefires; were kindled to light his downward path, he will return again at the Winter Solstice, when the Yule logs and lit fir-braches will guide His return. A few of other deities associated with Midsummer include: Lugh, Lleu, Lugos, Aine. This is the beginning of the three autumn harvest festivals, the other two being Mabon and Samhain. It is a celebration of the first wheat and grain harvest. Some people incorporate the tradition of baking the figure of a god into bread and symbolically sacrificing and eating it into celebrating this sabbat. This is a celebration of a feast of thanksgiving for the first fruits of the harvest, being grain and bread. The feasts reflect this celebration. In Christianity, the first wheat harvest was used to bake a loaf of bread for the church. 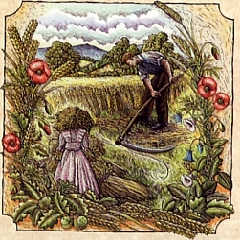 Lammas also represents the culmination of the marriage between the Goddess and the God that took place on Beltane. The God now becomes the product of that blessed union – the bountiful fruits and grains – and must be sacrificed. He is the personification of the crops that must be harvested for the survival of the people. This is the fall equinox and the second harvest sabbat in the Wiccan calendar. The equinox means the day and night are equal in time. It is a ritual of thanksgiving for the fruits of the earth and a recognition of the need to share them to secure the blessings of the Goddess and the God during the winter months. We all take a moment to pay our respects to the impending dark. We also give thanks to the waning sunlight as we store our harvest of this year’s crops. Offerings of ciders, wines, herbs and fertilizer are appropriate at this time. Wiccans celebrate the aging Goddess as she passes from Mother to Crone, and her consort the God as he prepares for death and re-birth. When I posted this blog yesterday, I did not expect so many questions from my readers. In general, people have been supportive, which I really appreciate a lot. I assume those who are not supportive are keeping quiet. That’s fine by me! I said I would try to answer as many questions about John Wilkes Booth as I could and there were some funny ones and some very serious ones. Many of them I can answer on my own from the previous encounters with him. Some of the answers I’ve gotten from an intuitive approach. My hope is that I’m interpreting things correctly. If I misinterpret something, I’m sure I will be corrected one way or another. So here are some of the reader questions. What is Georgiana’s real identity? Georgiana Tate is the fictional identity of the young lady I have been writing about in regards to her relationship with John, at his urging. I was given a false name because, I think, he just wants people to realize there was more to him than killing Lincoln and a real identity might cheapen the theme. There’s also a theatrical element to everything he does and says, so I’ve already noticed some embellishment and misdirection on his part. I believe Georgiana was Miss Isabel Sumner from Boston. They had an affair in 1864. She was only 16 and he was rather attached to her in my opinion because her affection cooled first and he traveled to her to try and repair their relationship. He gave her a pearl ring with the inscription “J.W.B. to I.S.” and she sent him flowers when he was sick. They exchanged letters when they were not together and there is some indication that she traveled to see him. She fits the description he gave me. There are also passages dealing with Lucy Hale, his fiance after he was with Isabel Sumner. I’m not sure why it’s her that has the focus of the story. Maybe there’s an element of unrequited love on his part. Maybe she’s living out there somewhere now and might read the book, which would fit with his dramatic nature. I don’t know. Do you know if [Booth] and Lincoln have met since their deaths? I think Lincoln and John have encountered each other in the afterlife, yes. It’s a situation of trying to communicate to work out issues. They may be finished with each other but that doesn’t mean the individuals have healed their own scars. Healing the self is often the last consideration and very neglected. Why hasn’t Booth reincarnated yet? I think John is hesitant to reincarnate. He has a lot of emotional scars. Lincoln is not reincarnated right now either. I think he came and went once since “Lincoln” but I do think John hasn’t returned since 1865. There are many issues going on with him that I have not pinpointed and he has no intention of discussing but it strikes me as some kind of trauma. I think there might be a lot of resentment, regret, emotional wounds, a fear of going through this cycle again, etc. He needs a long break between lives at this time in his journey. He’s damaged and trying to put himself back together, I think. Did Booth survive the manhunt and live out his life incognito? This question I cannot answer with certainty. 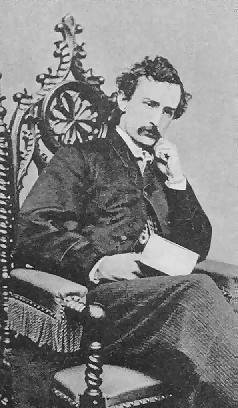 I have not seen John (by seen, I mean dreams and in my third eye while awake) beyond his late twenties, which is how old he was in 1865. That leads me to believe, personally, that he did not live beyond that point and the conspiracy theories are not true. It’s also just as possible that he did survive but he won’t show me that incognito part of his life. I do not feel that he survived and escaped though. He’s so damaged and emotionally scarred that the 1865 incident feels very fresh and raw when he’s around. I haven’t the slightest idea. That’s what I’ve been trying to figure out since it started. As far as I can surmise, I’m female and sympathetic to him. He does not get along with males unless he’s allowed to be the dominant force and that’s something about his personality that was with him long before he was “John Wilkes Booth”. When I say I’m sympathetic, I mean I comprehend that although April 1865 made him a famous villain, it is only one incident in hundreds of years of life. I believe criminals should be punished to the full extent of the law in order to keep civility in this world and teach right from wrong. John was punished. He’s punishing himself now because he is still very damaged. He needs to heal just like Lincoln does and they need to leave the baggage in the past in order to live better lives in the future. Maybe he sees that I can see beyond the villain. I don’t know. You said in another life time the energy that became Lincoln had killed whoever Booth was before. Who were they before and what era did that take place? It goes back to the Romans vs the … uh … Barbarians? They were both Roman soldiers at some point. “Lincoln” was higher placed and not very good at the job. There was some corruption there that led to “Booth” and others being killed unnecessarily to make him look good. It’s been going back and forth between them since then. They’ll eventually make peace, I think. The animosity is not what it was. About the missing [journal pages]. Next time he does show up, can you please ask him which two members of Lincoln’s staff was in this? I want to say I saw Stanton on the papers but I had a hard time reading things too. I didn’t get to look for a long time. I was also shocked by the entire incident when I woke up and lost several details, like how we even got there. If Stanton was involved, I feel like it was indirect. Someone else made a comment that he might have known something of that nature was coming but didn’t exactly jump into action to stop it. I think that’s pretty accurate. Again, we have to remember that I believe John was mentally ill, so the rambling angry nature of his last pieces of writing might have jumbled the truth. So while he might have written about Stanton and another man in the cabinet, we don’t know the whole story. In all honesty, my attempts at reading his energy show huge black gaps in the last month or so in his life, meaning his mental illness(es) were very bad and he might have been experiencing gaps in memory. It’s complicated. Yes, he’s a gentleman but I’m very aware that I’m being used. I’m also aware that he hasn’t learned to behave in any other way in his various lifetimes. He tends to choose handsome bodies and traits that are charming and irresistible because those are skills that he has mastered. I don’t think he’s very willing to stretch beyond his comfort zone. I’ve wondered why I don’t put a stop to the periodic visits too but I think since I’m a “fixer”, I may subconsciously think I could have some positive affect on him. Besides, if he wasn’t a gentleman, I’m quite certain he would be dealt with by someone else. Do you do seances or summon Booth somehow? No. I do not advocate seances or summoning. He shows up when he shows up and I don’t think I have any control over it. There have been five total visits since November. Frankly, I find him to be so dominating of a presence in my house that I get exhausted by the time it’s over. Think of trying to ignore a small child who has no one else to play with and breaks things to get your attention when you’re ignoring him. That’s what he’s like. Have you seen any other famous ghosts? Just one. I had been told that a certain famous figure will come visit if you ask for it because he’s a people person and enjoys sharing energy. I didn’t believe it, so I tried it, and it worked three times. White feathers have been appearing in strange places since I opened that line of communication (a clue if you really want to try and identify him). I don’t really want to say who he is though.